Little Man Huxley Cruised Down The Aisle in His Big Airplane to Celebrate Mommy and Daddy! It was a sweet and poignant moment during John and Theresa’s wedding ceremony on Saturday afternoon at Bastyr Chapel. I was at the front with John and his guys watching family process down the aisle to beautiful music by a trio. And then it was Huxley’s turn! 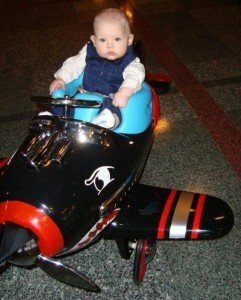 This handsome 5-month-old little man, accompanied by John’s parents, “cruised down the aisle” in his very big airplane, in celebration of Mommy and Daddy’s wedding day. During John and Theresa’s ceremony, Huxley did an amazing job. He participated in the ceremony with a smile and sat with John’s parents, relaxed and happy. John and Theresa – it was such a happy honor and delight for me to share in your wedding day. I look at the two of you and your son and know that our world is that much better because of the love radiating out from what you share and have created together. Comments Off on Little Man Huxley Cruised Down The Aisle in His Big Airplane to Celebrate Mommy and Daddy!